Market performance over the past decade has herded almost all investors into the same stocks or the same investment strategies. The end result is that trades remain more crowded than ever. Thus, it is an ideal time to be a contrarian. A 60:40 allocation to passive long-only equities and bonds has been a great proposition for the last 35 years… We are profoundly worried that this could be a risky allocation over the next 10." Bull markets are born on pessimism, grow on skepticism, mature on optimism, and die on euphoria"
In November of 2018, I pondered in a public SA article that almost all investors had been winnowed into one of four categories, specifically trend following traders, ETF traders, meaning those who frequently trade popular ETFs like the United States Oil ETF (USO) or the SPDR Gold Trust (GLD), buy-and-hold forever investors, including passive investors, and dividend growth investors. Later that month, I illustrated how crowded trades were unwinding throughout 2018 and there was one big crowded trade to go. The following are links to these prior two articles for further background reading. Has Everyone Become A Trader, FAANG Holder, Or DGI Investor? Somewhat improbably, the last crowded trade to unwind in 2018, specifically the S&P 500 Index, as measured by the SPDR S&P 500 ETF (SPY), has sprung back to life in 2019, rising 10 of the past 12 weeks after a harrowing plunge in fourth quarter of 2018, which was capped off by a brutal month of December of 2018. Does this rally have legs, and what does it mean for our four categories of investors described above? Those are the questions I will try to answer in this article. The financial markets are slowing returning to normal, one burst bubble at time, paving the way for an epic reversion to the mean trade between what is in favor and what's out of favor. 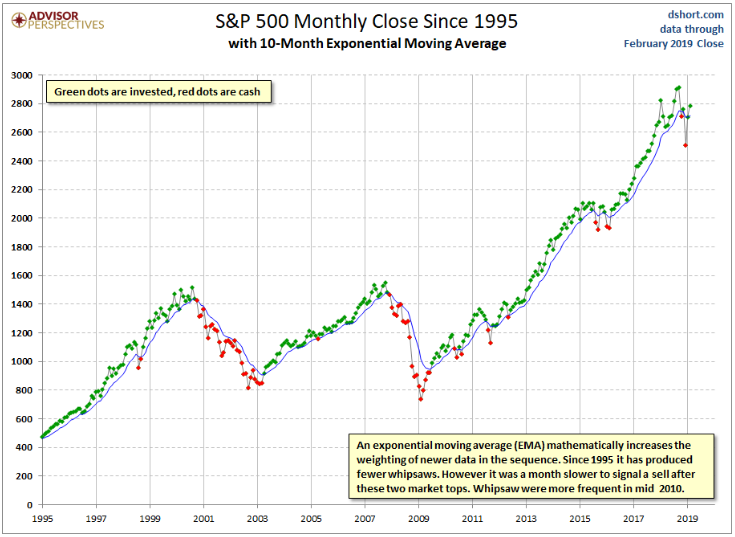 The first category of investors I have identified, trend following investors, who use simple moving averages, and those that use exponential moving averages, are both back in the S&P 500 Index based on monthly closes, as the following charts show. The second category of investors that I have identified, ETF traders, have been emboldened by the volatility the past six months and these investors remain convinced that they have the magic key to the markets. The third category of investors I have identified, the buy-and-hold forever investors, including passive index investors, have also been emboldened by the bounce back in the markets, specifically the bounce-back in the S&P 500 Index, as measured by the SPDR S&P 500 ETF pictured below, and the bounce-back in the Invesco QQQ ETF (QQQ), which is also shown below. Looking at the above, the recent dips look like minor drops in the bigger picture, at least so far, and buy-and-hold investors, who have been rewarded by buying the dips for a long time, have had no incentive, yet, to change their behavior. Moving onto the last category of investors I have identified, which are the dividend growth investors. These investors who prefer equities with a long uninterrupted history of growing their dividends, including 3M Co. (MMM), Coca-Cola (KO), Procter & Gamble (PG), Johnson & Johnson (JNJ), and McDonald's (MCD) have been emboldened too, as the bounce-back in the broader equity markets has lifted their share prices. Adding to the narrative, stocks like Procter & Gamble (shown above) and McDonald's Corp. have gotten an extra boost, as longer-term bond yields have headed lower, convincing many that defensive, low-beta investments are favored investments right now. Personally, I think the bond bear market is still intact, however, this is a minority view at the current juncture. 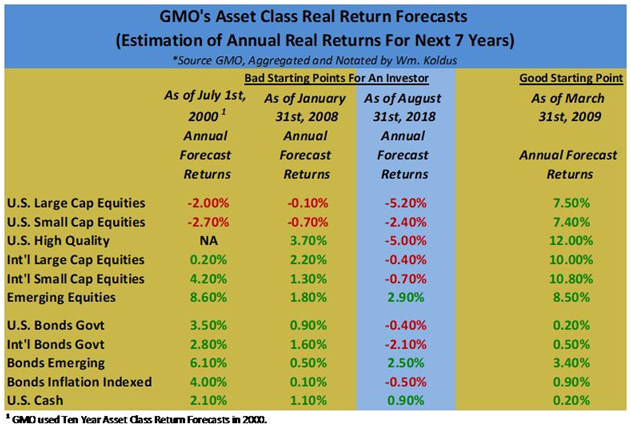 Throughout my years writing on Seeking Alpha, I have frequently used the following table to show perspective on future market real returns. 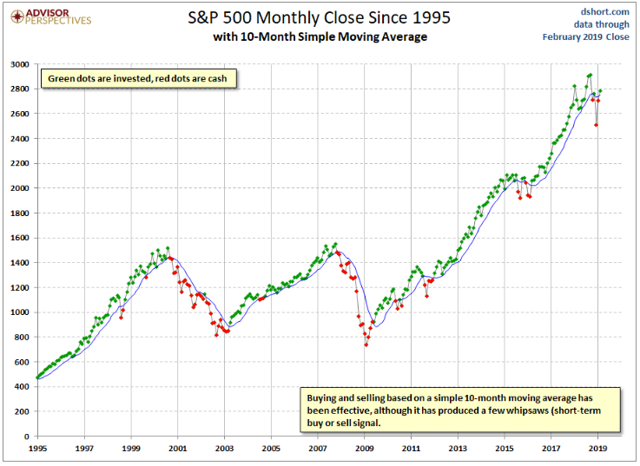 With the benefit of hindsight, the actual price action of the stock market has far surpassed the real return expectations of one of the preeminent value managers in the world, at least in the intermediate term. The outperformance from dismal expectations, however, does not change where we stand and that specifically is at historically high market valuations, particularly after the rapid rebound in 2019, which means lower future returns going forward. Adding to the narrative, record high profit margins appear to have peaked, as rising wages and rising commodity prices lift input costs, and if profit margins, which are one of the most mean-reverting data series in all of finance, are normalized in any manner, then this could be a significant market headwind, as opposed to the tailwind that has existed for much of the past decade. As shown earlier, perceived safe-haven equities, including Procter & Gamble and McDonald's have been the recipient of capital flows as investors are shaken following the deep drawn down in the fourth quarter of 2018, which has been followed by a sharp rebound. The same dynamic, meaning capital flows looking for safety, has driven bond prices, as measured by the iShares 20+Year Treasury Bond ETF (TLT), higher, even with the sharp rebound in the broader stock market. Higher long-term bond prices, even in a rising stock market, have provided a further tailwind to interest rate sensitive sectors, including utilities, as measured by the Utilities Select Sector SPDR ETF (XLU), and REITs, as measured by the iShares U.S. Real Estate ETF (IYR), which are both shown below. Utilities and REITs are both making new all-time highs, and this is true for the broader sector indexes, as well as individually favored companies like Realty Income (O). Looking at the charts above, it is not hard to see that Utilities and REITs have become bond proxies, and the sigh of relief from long-term bond yields retreating has resulted in a melt-up in these income-oriented securities in the opening months of 2019. The market remains very tightly intertwined, and the predominant categories of investors, all have their offensive teams back on the field. Trend followers, ETF traders, buy-and-hold investors, and dividend growth investors, which have become the dominant investors through years of winnowing, funneling, and the attrition of other investment strategies, all have not seen a challenge to their dominance, so naturally, investors who have been rewarded in the past decade keep returning to these equities and investment strategies. What would flummox all the renewed crowded trades, the in-favor investments, investors, and investment strategies collectively, where almost all investors own the same stocks? How about a capital rotation from growth to value, spurred on by rising interest rates? Right now, this is viewed as highly improbable by many market participants, however, the investment markets have a habit of making the highly improbable happen on a routine basis. Bigger picture, fundamentals still do matter, fundamentals were always the wrong scapegoat, and I still believe 2019 is going to be a banner year for value equities, as price discovery, after a decade of growth outperforming value, is poised to return with a vengeance. To close, even though it has been a very difficult almost decade-long stretch for value-oriented investors, with pockets of significant outperformance, including 2016, I think we are about to enter a golden age for active, value investors, who do the fundamental work, who can find the future free cash flow leading companies, and the most out-of-favor sectors and the most out-of-favor equities, including this recent public write-up, will be at the forefront of this opportunity. For further perspective on how the investment landscape is changing, and where to find the 15% and 20% free cash flow yielding companies of tomorrow, and for help in finding under-priced, out-of-favor equities with significant appreciation potential relative to the broader market, consider joining a unique community of contrarian, value investors that have thrived in 2016 and weathered the storm in 2017 to become closer as a collaborative team of battle-tested analysts. Collectively, we make up The Contrarian, sign up here to join. Disclosure: I am/we are short SPY AS A MARKET HEDGE AND I AM SHORT TLT THROUGH PUT OPTIONS. I wrote this article myself, and it expresses my own opinions. I am not receiving compensation for it (other than from Seeking Alpha). I have no business relationship with any company whose stock is mentioned in this article. Additional disclosure: Every investor's situation is different. Positions can change at any time without warning. Please do your own due diligence and consult with your financial advisor, if you have one, before making any investment decisions. The author is not acting in an investment adviser capacity. The author's opinions expressed herein address only select aspects of potential investment in securities of the companies mentioned and cannot be a substitute for comprehensive investment analysis. The author recommends that potential and existing investors conduct thorough investment research of their own, including detailed review of the companies' SEC filings. Any opinions or estimates constitute the author's best judgment as of the date of publication, and are subject to change without notice.